2 of the images today were shot outside looking through glass so I am afraid the quality will not be stellar but I hope they still give you a good visual. I will be signing books tonight at the downtown Seattle Barnes & Noble beginning at 7. If you are still in need of a Mother’s Day gift, I think this just might be the ticket. Many, many I have signed the last 2 days have been just for that purpose of gifting. Do stop by, if even to say hello, if you find yourself in that neck of the woods. I so desperately don’t want the book to overshadow the flow of daily posts but also want to keep everyone up on what is going on with it just in case I end up being in your neighborhood, either near or far. 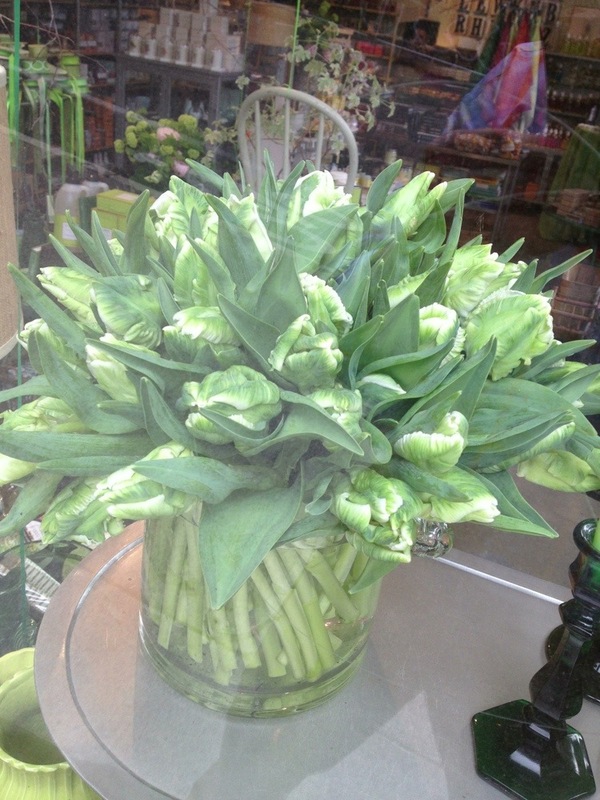 Which leads me to fluttery white parrot tulips goodness with a good deal of green in them too. The below image was also shot through glass, when I stood outside on Spring Street and took the photo looking onto a Home store display. These were an exceptional gift to me the other day and I just really wanted to share their beauty with you today. Pure flower happiness wrapped up in a crystal ice bucket! They are so good I even brought them with me to my glassybaby signing last night. Their beauty working right in with the beauty of what the glass blowers were creating. 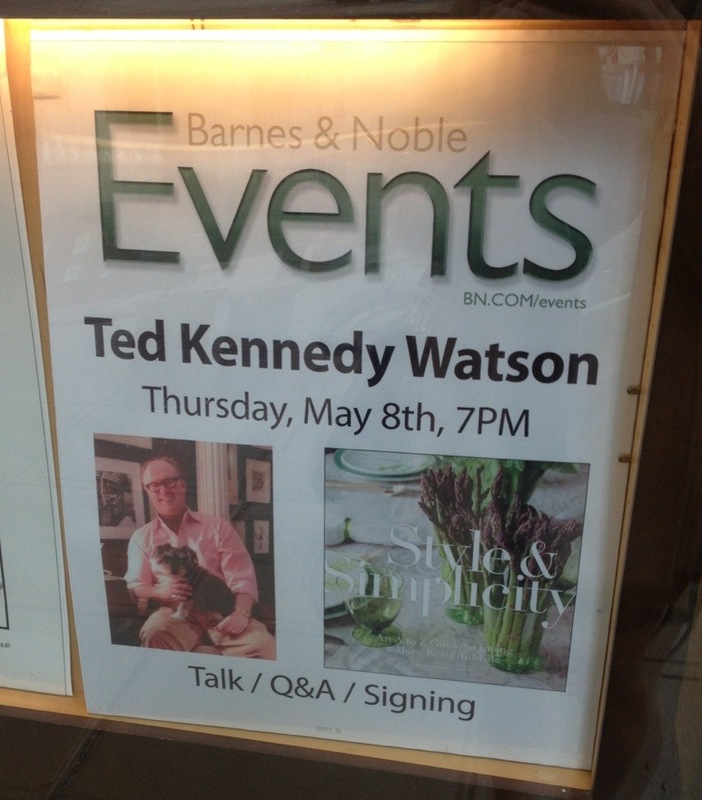 To start things off I will be signing at the Watson Kennedy First & Spring shop on Tuesday the 6th from 10-4. Complimentary Mariage Frères tea will be served throughout the day. 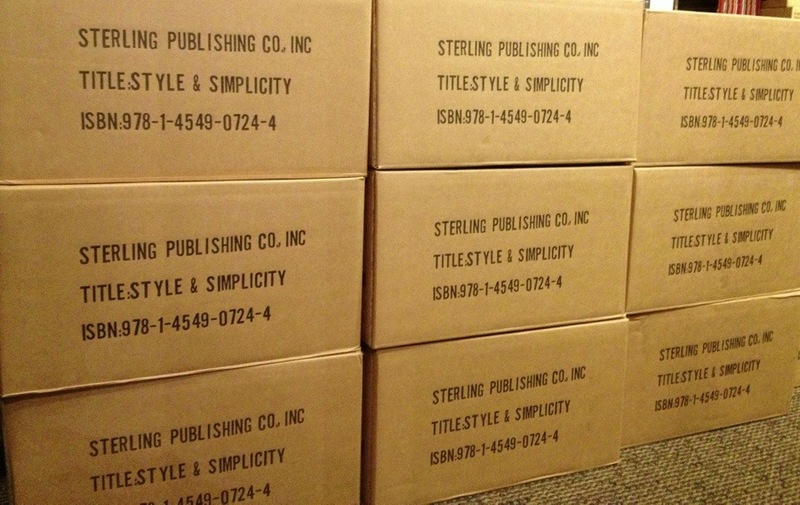 The book signing party begins at 5. A ticket for admission is needed. There are just a few spots left, so please call the shop at 206.652.8350 if you would like to buy a ticket. Will be such a fun day! 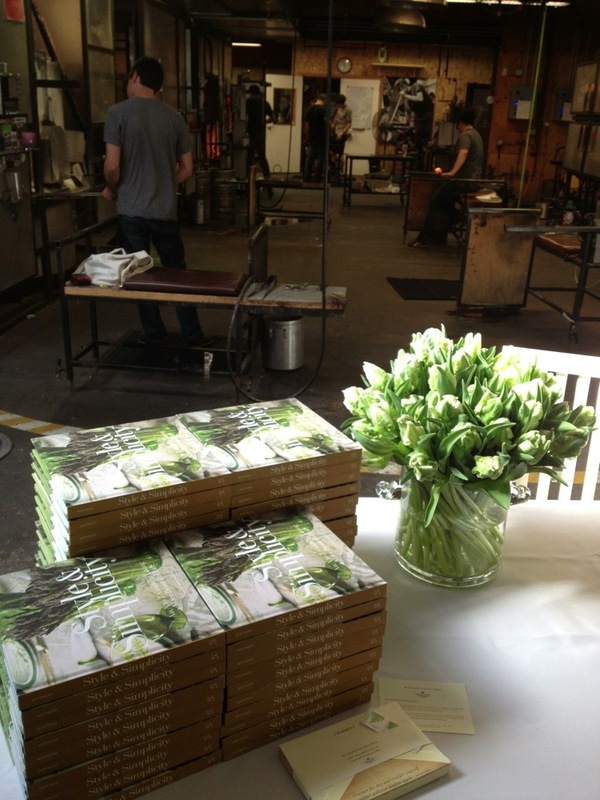 Then onto the Glassybaby in Madrona on Wednesday the 7th with a signing from 5 to 7. Thursday the 8th I will be at the downtown Seattle Barnes & Noble signing from 7 to 9. Friday I will be at the West Seattle Metropolitan Market from 4 to 6. Saturday the 10th, I will be signing all day at my Market shop for the Mother’s Day Open House from 10 to 6. We will be serving tangerine mimosas throughout the day at both shops. Signed copies will be available at the First Avenue shop that day too. 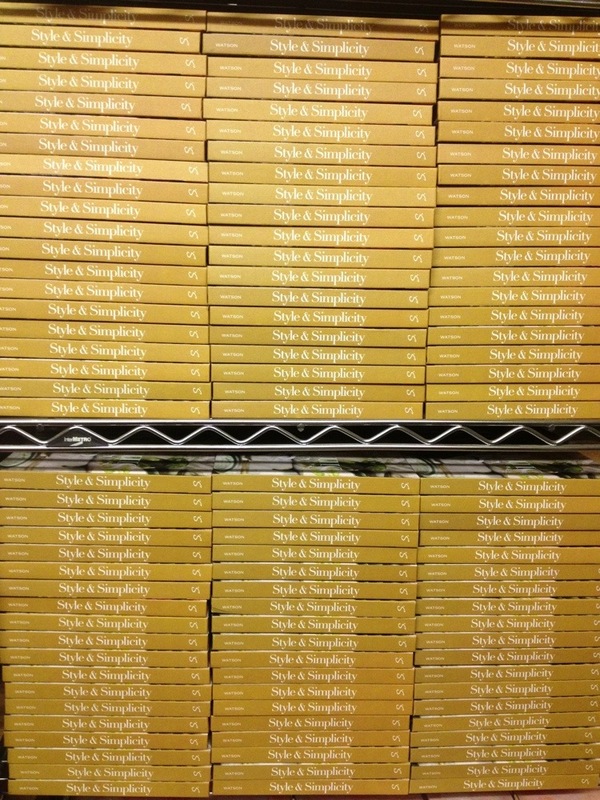 Actually, signed copies will always be at the ready starting at both shops on Tuesday. If I am around, I am happy to personalize for you too. I am also more than happy to personalize books that you purchased on Amazon, Barnes & Noble or from a fab independent retailer who is carrying the book. Truly, if I am around, don’t be shy. I love meeting new folks and would love to sign your book. I am just so darn pleased you bought it! Merci, merci. Now for a little flowery Sunday goodness. These stopped me in my tracks yesterday at the Market. 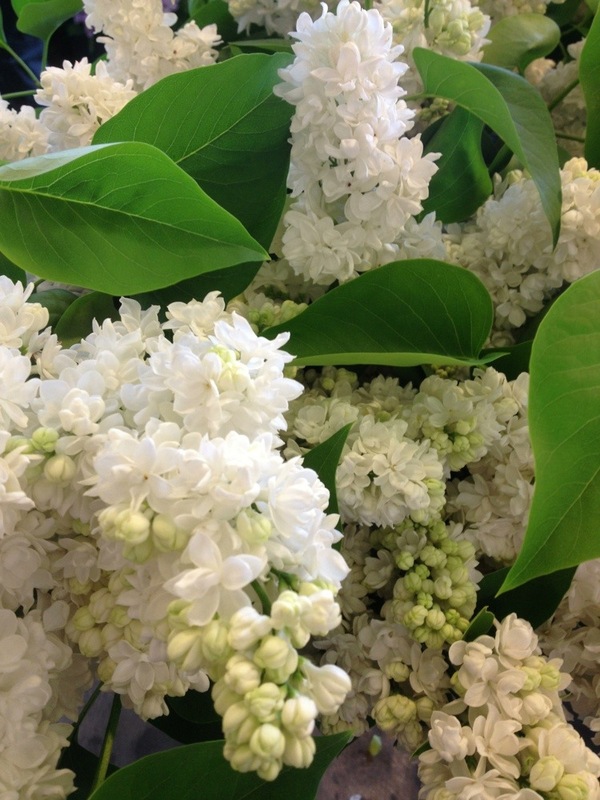 Was in white lilac heaven throughout the day at the shop while I worked. Breathtaking. Enjoy.